Skim and scan through this website to answer the questions below. Remember, we are looking for level-3 quality answers! How might 3D printing of food benefit society? 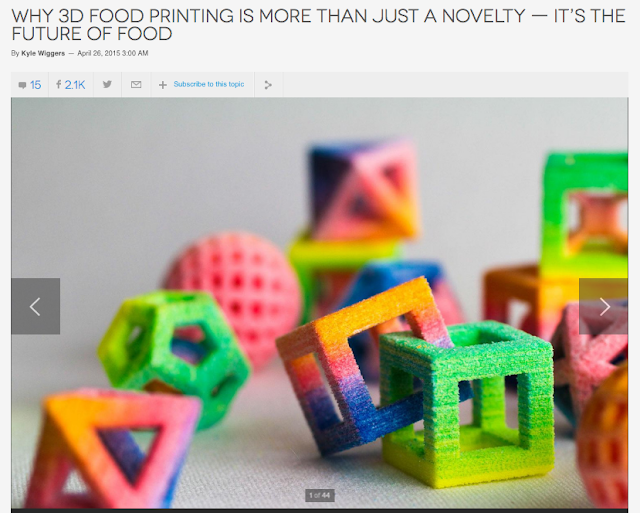 Would you eat 3D printed food? Why/Why not? Which 3D food printer do you think is best? How might 3D printing of food harm society? 3D printed food could harm society, because it can't meet our nutritional needs such as vitamins or minerals, as it is only plastic. Although some printers now can take food in and turn it into more/different food. Food distributors, such as supermarkets or grocers, will lose out as everyone would have eventually bought or borrowed a 3D printer, and could be using it to print food. Well-structured, thoughtful answer Bella. I like your consideration of how 3D printing of food might impact supermarkets. Companies are currently competing to produce the best 3D food printers. Describe the habits of mind someone might need to compete in this market. 3D printed food is not proper food so it will not give us the fibres and vitamins that we need to keep us healthy. If we don't sustain our health to a good standard we could get very sick. The food would probably be tasteless as well. You have clearly articulated your point, but there is a lack of evidence here!